When you’re looking for a quick meal, it’s a bonus to keep calories down and taste up in the process. Stir frys and curries are a great way to save time, get a bunch of veggies in, keep calories down, and still manage to have lots of flavor. Just like dinner bowls, they’re very easy to customize. You can serve them over rice, quinoa, noodles. You can use a variety of veggies based on what your family likes and what happens to be on sale that week. Yep, even your wallet might like curry bowls. You can also vary the flavor by changing out the sauce. This curry bowl is great for you batch cookers. 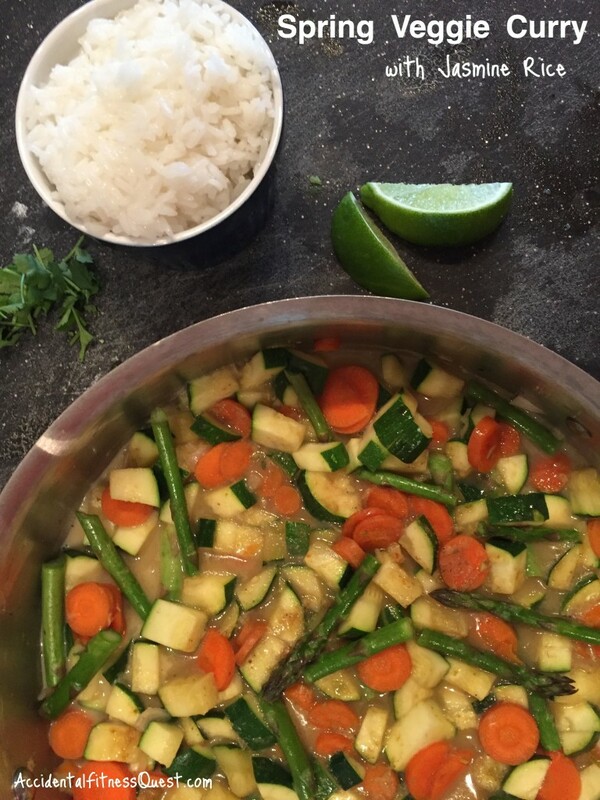 Make a big batch of jasmine rice on the weekend and use part of it to serve with the veggie curry. You can also throw in grilled chicken or steak strips, or any protein you’ve got prepped as well. The coconut milk and sugar adds a creamy sweetness to the sauce to balance out the spice from the curry paste. Bring 1 cup of water to a boil in a small pot and stir in the rice. Lower heat to low and cover. Cook for about 10-12 minutes until the rice is done. Fluff with a fork and set aside. While the rice is cooking, chop the veggies. Spray a large skillet with non-stick spray and heat over medium heat. Add the carrots, zucchini, asparagus and white parts of the onion. Cook over medium heat, stirring occasionally, until softened. About 3-5 minutes. Add the coconut milk, lime juice, curry paste, ginger, sugar, and soy sauce. Stir to combine. Simmer over medium heat until the sauce begins to thicken slightly and the veggies are tender. About 8-10 minutes. Remove from heat. Divide curry evenly into bowls and top with rice. Garnish with cilantro, lime slices, and the green parts of the onion. Makes 4 servings at approximately 209 calories each – 5g protein, 36g carbs, and 5g fat. Curry paste varies in heat based on the color and the amount of Thai chili peppers used. Yellow is the mildest with just a little kick to it. Green is in the middle range and red is the hottest. Most grocery stores carry the green and red in their international aisle. The yellow is a little harder to find and is more common at places like World Market, Whole Foods and Asian markets. Have fun with your veggie selection and your curry bowls while you save time making dinner. If you’re interested in working with me to get meals together fast while working towards your health goals and feeding a family, I’d love to chat. You don’t have to and shouldn’t eat differently while dieting than the rest of your family. Drop me an email, or come on over to Facebook and ask a question.